Engineered stone countertops are handsome and virtually maintenance free. When kitchen remodelers and home improvement sites talk about engineered stone countertops, most often they are referring to the stone-like countertops produced by mixing crushed natural quartz with colorants and polyester resin in a proportion of about 97% quartz to 3% resin. The resulting countertops can simulate natural stone slabs or they can present their own distinctive character. Because these countertops contain predominantly quartz, they are also commonly called quartz countertops. By design, engineered stone countertops overcome some of the disadvantages of their natural stone counterparts. Where natural stone—usually granite or marble—is porous and must be initially sealed and regularly resealed to prevent staining and mold growth, engineered stone countertops are non-porous and require little special care. Where natural stone exhibits the variations of color and pattern inherent in a material formed by natural processes as well as the structural flaws that can accompany those variations, engineered quartz countertops are generally more uniform and consistent in structure. Engineered stone comes in a wide range of colors and textures. While not the most expensive option, engineered stone countertops signal an appreciation of beauty married with functionality. When you ask how much engineered stone countertops cost, the answer you likely will get is, "It depends." "Depends on what?" you may ask. First of all, the cost of the engineered stone itself is variable and depends on the grade, which is a reflection of the refinement and sophistication of the product's appearance. Quartz countertops are an international product, manufactured in countries around the world, so shipping cost, as well as the cost of labor in the local economy, can be a factor. That makes it a good idea to compare the cost of similar-appearing countertops between the various brands. Costs vary from region to region within the U.S. as well. Once again, shipping costs are a factor and for those outside of a major metropolitan area, the ability to compare brands may be limited. Since fitting and installing engineered stone countertops is a skilled procedure and requires special tools and equipment, most quartz countertops need to be installed by a professional. In areas where the cost of living is high, the installation costs are likely to also be comparatively higher. Custom edges add character to quartz countertops and increase the cost. Of course, the individual details of each kitchen or bathroom installation will play a determining role in the ultimate cost of the countertops. Edge treatment is one of those considerations. Most of the estimates for quartz countertops will assume a plain, smooth, straight edge known as an eased edge. If you prefer something fancier, a rounded edge—known as a _bullnose_—will cost extra and an _ogee_—an "S"-shape edge—will likely cost even more. Your countertop supplier can advise you on all the possible edge treatments and their effect on the cost. Your countertop layout will also influence the cost. Where a solid, straight run of counter is the least expensive alternative, beveled turns, rounded corners and cut-outs for sinks all incur additional expense, which your installer can explain. Countertop costs are usually expressed in terms of cost per square foot. When comparing costs between quartz countertop brands, be certain you clarify whether the quoted cost is the raw cost for the countertop material or for the countertop installed. If you are considering other types of countertop in addition to engineered stone, it's best to compare the installed costs. As indicated earlier, the cost per square foot of installed quartz countertops varies depending on the grade of the material and also by the going rate for installation in a particular region. As you might expect, high cost of living areas such as the San Francisco Bay area or New York City and its environs present some of the highest costs per square foot. In places like those, expect to pay $60.00 per square foot to $125.00 per square foot. In other metropolitan areas, like Des Moines, Houston, Atlanta or Denver, the price range will be slightly lower, from $55.00 per square foot to $100.00 per square foot. To put the cost of engineered stone countertops in perspective, it might be useful to compare them with other possible countertop choices. Choosing the right countertop material requires balancing material and installation cost against ongoing maintenance requirements and weighing it all against your personal taste. Natural stone carries perhaps the widest range of cost per square foot. That's because some colors and patterns are considered more desirable than others and stone types vary in rarity. Each piece of natural stone is, after all, unique. While marble is elegant, it is relatively soft and porous, requiring special care and periodic maintenance. Marble is not generally recommended for heavy use. Depending on the grade of marble chosen, countertops from this material can cost $75 to $200 per square foot. Natural granite is harder and more durable than marble but no less porous. Like marble, granite must be sealed and then occasionally resealed to forestall staining and the possibility of mold growth. As with marble, certain colors and veining patterns of granite are more-or-less desirable. The cost of natural granite is affected accordingly. Expect to pay from $45 to $200 per square foot. Soapstone is another option when considering natural stone countertops. Less glamorous than marble or granite, soapstone is, however, non-porous and naturally impervious to staining. The surface is relatively soft and prone to cuts and scratching, but since it's uniform throughout, those blemishes can be sanded away. In colors ranging from mottled white to gray to greenish, soapstone is less common than granite or marble, yielding per-square-foot costs of $60 to $185. Stainless steel is the hardworking standard for serious cooks. The mainstay of professional restaurant kitchens, stainless steel is often the preferred choice of serious home cooks as well. Durable and easy to clean but subject to scratches and fingerprints, stainless steel is available in several gauges and also with a choice of finishes. There is little maintenance cost incurred with stainless steel countertops, but the initial installation can range from $80 to $225 per square foot. Solid surface is an economical and attractive alternative to engineered stone. Like engineered stone, solid surface countertops are non-porous and resist staining and contamination while needing minimal maintenance. Cast from solid acrylic with small amounts of minerals and other particulates for patterning, solid surface countertops are attractive and durable though less heat resistant than engineered quartz. Superficial damage to solid surface countertops can usually be removed with fine sandpaper. Familiarly known by the names of leading brands like Corian and Swanstone, solid surface countertops are a more economical alternative than stone. Typical cost of solid surface countertops will run from $35 to $85 per square foot. Wood is warm and appealing but requires maintenance. Wood is warm and intrinsically beautiful and richly enhances a kitchen, but wood carries liabilities as well. There are, of course, many different kinds of wood, some commonplace and some exotic, as well as fabricated wood products such as butcher block, and that diversity influences the ultimate cost of installed wood countertops. Wood requires continual maintenance. Wood is subject to staining, has limited heat resistance, and cuts and scratches easily. Because "wood" encompasses such a broad spectrum of materials and treatments, wood countertops can cost anywhere from $40 to $200 per square foot. One of the most economical choices for a countertop treatment, ceramic tiles are available in just about any style and color you might desire. Ceramic tile is also one of the most accessible do-it-yourself countertop materials, making it possible to keep costs even lower. Tile is supremely heat resistant, and the tile itself won't stain but the grout will unless it's kept carefully sealed. Installed tile countertops will cost from $18 to $35 per square foot. Laminate countertops are cost effective and surprisingly durable. As economical as ceramic tile but with a smoother, easier-to-maintain surface, laminate countertops are a popular, attractive choice. 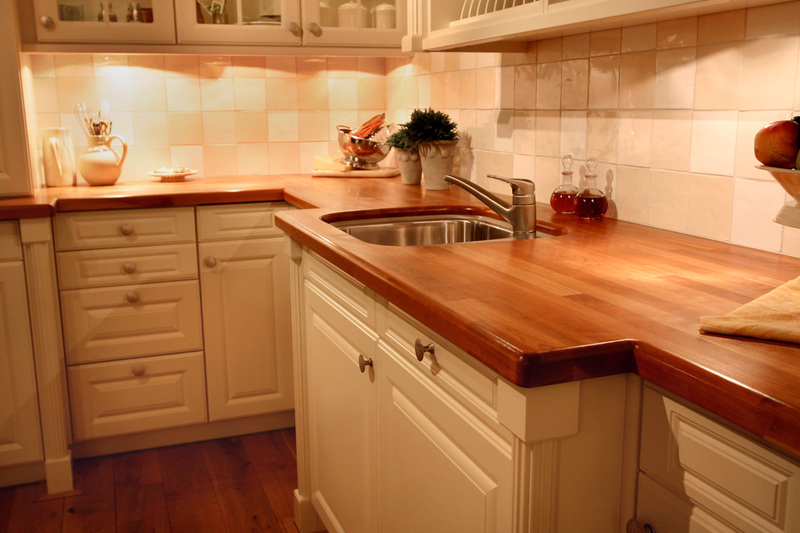 With a little care, laminate countertops can prove durable and functional, resistant to stains and moderate heat. Where the kitchen layout allows, laminate countertops may be purchased as pre-formed lengths molded with a rounded edge and built-in backsplash. Custom-built laminate countertops can be constructed to accommodate any kitchen. Laminate countertops usually cost from $15 to $40 per square foot. Choosing the right countertop for your kitchen entails consideration of both aesthetics and utility. The price per square foot of a countertop material may be critical or not, depending on the size of your kitchen and your overall budget. At any rate, your countertops are something you are likely to be living with for a long time so before making any decision, it's best to get the advice of a contractor or countertop specialist you trust.